Behind the polished outer oak panels of the organ in Christ Church, lie a great number of very delicate and craftsman-made parts that make up our fine instrument. A church organ such as ours is the largest and by far the most expensive furnishing in Christ Church. Properly cared for, because it is a well-made instrument, it will continue to give service for generations. Most of our organ is now at least a century old and most of it is still in good working order. Christ Church organ in very recent years has done remarkably well to survive the badly leaking organ chamber roof, not to mention being encased in a giant plastic wrapper for over a year. Now that the work on the chancel area fabric has been completed, we will need to put right some of the damage caused by wear and tear as well as the incoming rainwater and contractors’ dust and dirt to the organ. Our organ in Christ Church is a wind instrument with three keyboards for the player’s hands and a separate keyboard for the player’s feet. The keyboards are linked to the pipes by complex electrical circuits, but the musical sound you hear comes from air being blown through the organ’s pipes. There is a separate pipe for all 56 notes of each stop. There are 42 different sounding stops, making a total in excess of 2,000 pipes. Organ pipes are mostly made of a tin-lead alloy which is resistant to corrosion but very sensitive to physical damage, water and dust. Each pipe needs to be individually tuned to put the whole instrument in tune. Temperature changes in church very quickly affect the pitch of the pipes so the organ needs regular tuning twice, and occasionally more than twice, each year. The first organ in Christ Church was installed in 1825, four years after the church opened, in the gallery above what is now the parish room. It was built by John Ward of York, who had also built the organ in the Halifax Square Chapel in 1821. It was small but still cost £400. Clearly some sacrificial giving to pay for it must have taken place by the then congregation, when the average annual earnings of a textile worker were somewhere around £70. This organ was dismantled in 1865 by Conachers of Huddersfield, who provided a ‘replacement’ at a cost of £266, the price indicating that a lot of recycling of the pipes and parts that made up the original organ must have been done. In 1873-4, Christ Church was extended with the building of the present-day chancel which was provided with the large purpose-made organ chamber you see on the left as you face the altar. The organ was moved here from the gallery. However in 1894 there was a major fire in the church which started in the organ after a service, perhaps because the candle used for light by the man who pumped the bellows had been left burning. The fire destroyed most of the chancel and nave roof, as well as the organ itself. During this fire tragically Jonathan Coulston, a local firefighter, was killed when in thick smoke he fell through an open trap door in the tower. A new organ was provided as part of the reconstruction. This was now the third organ, and was built by Abbott & Smith of Leeds who built many other fine organs in the area. It was considerably larger than its predecessor. Christ Church then did no repair work to it, and made no changes at all, with the result that by 1979 the instrument was in a sorry state as the church felt unable to afford the costs of restoration at that time. However help was at hand! The Sowerby Bridge Organ Group, a non-professional group of three volunteer enthusiasts, Richard Barnes, Brian Biggin and George Barnard, came to the rescue and between 1979 and 1983 installed at cost a very fine replacement organ from the closed Bolton Brow Methodist Church. This had been originally built by J.J. Binns of Bramley, Leeds, and was notable for its quality and also for the fact that its bellows had originally been pumped by a water engine connected to the Rochdale Canal below, where the church owned and leased out the stables, warehouses etc directly under the church building. The present organ in Christ Church retains the very fine oak case and just four stops of pipes from the Abbott and Smith instrument, plus three stops from the organ in Warley Congregational Church. The instrument was also converted to electric control between the keyboards and pipes. After thirty years’ use these electrical contacts and switches needed replacing to keep the organ reliable. Therefore some work was done in 2006, which was paid for by fundraising through the generosity of the congregation, and the PCC has recently sanctioned further work. Such work can only be done by a specialist restorer and is therefore costly. The recent bequest from the late Fred Seed (very much a church music and organ enthusiast) has been utilised to cover the cost of this current work. Water damage to the trumpet stop has yet to be repaired, the rainwater from the leaking roof having damaged the leather and electrical parts, as well as clogging up the 56 trumpet pipes with dust and debris washed down from the roof. To many people, the accompaniment of a pipe organ for worship is almost taken for granted. We also have the benefit of the band who lead the music on ‘non-organ’ Sundays so the musical needs of the church are well catered for. These two styles complement each other and we are gradually drawing them together with our church musicians becoming interchangeable. 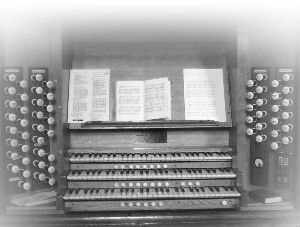 However, pipe organs have had an important role in the accompaniment of worship for many hundreds of years, and it is clearly the wish of the present congregation that Christ Church organ should continue to function well. In years to come, full-scale rebuilding of the organ may be necessary, which will be a highly expensive undertaking. To replace Christ Church organ with a similar brand-new pipe organ would cost somewhere close to £900,000 pounds – probably an under estimate. If the organ is cared for, this replacement should not be necessary, but nevertheless some difficult decisions will have to be made by future congregations as to how much can be afforded in the way of renovation. We have been given a wonderful musical instrument by past generations, and we now have the responsibility for it. Regular and careful maintenance, adaptation and renewal undertaken when necessary to meet the changing circumstances and needs of our worship will hopefully be possible so that future generations can benefit from our care of our musical heritage.